Baton Rouge, LA – April 22, 2015 – This Earth Day, digital billboards across the nation are encouraging people to discover and reconnect with national parks, thanks to a new effort from the out-of-home advertising industry in partnership with the National Park Foundation. Lamar Advertising Company (Nasdaq: LAMR), one of the largest outdoor advertising companies in North America, has donated space on its digital billboards nationwide for the Find Your Park public service campaign. Featuring more than 970 of its 2,100+ digital billboards across the U.S., Lamar will highlight photos of landscapes and monuments in hopes of inspiring mass audiences to seek out a park on Earth Day. In addition to Lamar’s digital billboard space, creative from the Find Your Park PSA campaign will run on advertising displays donated by various out-of-home media companies, as part of a national, industry wide initiative on April 22 coordinated by the Outdoor Advertising Association of America (OAAA). Find Your Park public service campaign creative displayed on digital billboard space donated by Lamar Advertising Company (left). Six additional designs will rotate on Lamar’s billboards nationwide for Earth Day (right). The Find Your Park campaign, which kicked off in April, is a multi-faceted two-year public awareness effort celebrating the centennial anniversary of the National Park Service (2016). For more information about the campaign, please visit OAAA.org or FindYourPark.com. Lamar Advertising Company (Nasdaq:“LAMR”) will release its first quarter ended March 31, 2015 earnings report before the market opens Wednesday, May 6, 2015. Commuters won't miss any action from the NCAA Men's Basketball tournament, thanks to the new #BillboardBrackets campaign from Lamar Advertising Company. 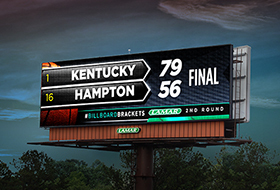 Using technology developed in-house, Lamar is displaying live scores and tweets with #BillboardBrackets on its network of digital billboards.